The Buckeye Trail is literally at our front door! How cool is that? The BTA has been organizing volunteers, maintaining the trail, conserving and protecting lands, mapping the trail, and much more since its inception in 1954. Their efforts have provided over 1,400 miles of hiking trails around the state of Ohio. In 2012, Milford had the official ribbon cutting making the city an official “Trail Town”. Since RRT’s first full year in 2011, we have been helping to sponsor events and fundraising for the BTA and, in 2012, became official sponsors of the Buckeye Trail Fest, the organization’s largest event. RRT continues support through events, Association promotions, and sponsorship. 2018 saw the first sponsored fundraiser for the Buckeye Trail at RRT. We were able to raise nearly $1,000 and also recruit over 2 dozen members for the BTA! We hope to co-organize more events including group hikes and increase exposure to this great trail as time goes on. Look for future events on the RRT page such as Buckeye Trail thru-hiker talks, ways to get involved, and trail town events! 2019’s fundraiser will be a day hike and camp out along the Buckeye Trail! This event is co-sponsored by RRT, Osprey, and Little Miami Brewing Co. Stay tuned for details as space will be limited. Milford Ohio fits the above definition as well or better than any town could. We are in fact the epitome of a trail town. We are home to over 22,000 miles of long distance hiking trail as the biggest trail junction in the United States. We are home to a “rails to trails” program that connects cities more than 70 miles apart. We are home to a National Scenic River that has year-round recreational opportunities. Lastly, we are home to a city that dates back to 1788 and boast unique shopping and dining experiences. As an outfitter we hope that RRT adds to the qualifications, that we bring additional excitement and attract and inspire more recreational use around the city and that we support users of our trails and river. But we cannot take credit for a single aspect that has built the outstanding resume that you see above. What we are proud of is that we settled in this city because we want to be part of this trail town, and because we recognized it’s potential. Every year we are lucky to meet and share in the experience of people walking one of three trails across the country, or around the entire state of Ohio. Every day we are lucky to personally enjoy and be immersed in the abundant recreation provided by the Little Miami Scenic Trail and River. Be it by foot, wheels, paddle, or pogo stick, this city ties it all together. There are a lot of cogs in the trail town system that make us who we are. The over half a dozen canoe and kayak liveries that operate in and around Milford are a big part of that machine. You see the Little Miami River isn’t a one shot or one season river. This is part of the reason why Cincinnati is the self-proclaimed paddle capital. This is why we have the largest and strongest paddling groups in the country. Not because we have short term destination whitewater, but because we have year round beauty and access that is beginner friendly and harnesses the passion of the sport. I reached out to Mark to get some facts, because what good is my nostalgia without facts? The numbers blew me away! In one year Mark will personally put about 16,000 people on the Little Miami River! This is local love right there, we aren’t talking about tourists from other cities. We are talking about a town and its love for the river. Furthermore he added that amongst the half dozen other liveries they would total about 100,000 people per year on the river! With a healthy and frequented river, so grows the city. This isn’t your grandma’s Milford anymore, although Grandma is still welcome and we love her dearly. In the past five years we have seen the city transform from half empty to overflowing. 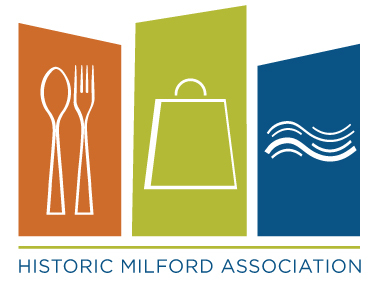 From a shopping and dining perspective Milford is blowing up, and if you’ve not been here in sometime then you have been missing out. 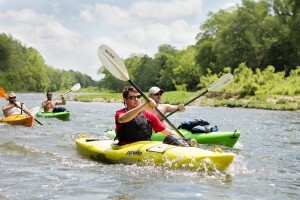 Downtown Milford hosts festivals, has a nature preserve, and even riverside camping. The city grows everyday making it more livable, more shop-able, and more fun. This year Milford has the opportunity to be part of Outside Magazine’s “Best Towns” competition as we compete to be the best “River Town”. Just having the nomination puts us as one of only sixteen cities to be voted on! So I ask you to please share this, to please vote, and to please spread the word. But also be proud, because if Milford is your city than you should know that it goes toe to toe with cities of a much larger reputation; like that of Bend Oregon, St. Louis Missouri , Charlotte North Carolina, the Appalachian Trails Harpers Ferry in West Virginia, and even Portland Oregon. If you are unfamiliar with the vast trail town resume I’ve mentioned please check it out. 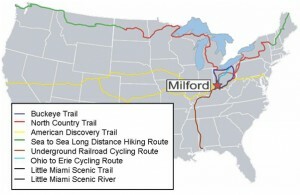 You can find the breakdown of all 22,000 miles of trails that cut right thru Milford on the cities website and the link provided at the end of the article. Special thanks to Mark, visit him in Loveland or Milford (lovelandcanoe.com // 513-683-4611).